THIS is important to know… Hurricane Spin Mop cleans way more than just floors! The long reach pole and microfiber head are perfect for those tough to reach cleaning spots throughout your home. Whether you are shining up crown molding, or dusting a ceiling fan, think Hurricane Spin Mop. Dirty windows? Not for long… Wash your windows using a dampened mop head, switch out to a dry mop head and buff dry. Your windows will never look so good. Want your car to sparkle? You can use either the Hurricane Spin Mop or the Hurricane Spin Scrubber to make cleaning so much easier. The extra reach of the Spin Mop will make easy work of the car roof, while the low speed, high torque Spin Scrubber helps remove even the most stubborn stain in hard to reach places. Thinking of painting – then do THIS first… Improve your results by wiping down your walls with the Spin Mop microfiber head. Millions of tiny fibers grab onto dust and leave your walls clean and ready for a fresh coat. Also works great removing fine drywall dust in new construction. When washing your microfiber mopheads… do not use a fabric softener. A softener will clog the open spaces of the microfiber and reduce the effectiveness of the strands. Air dry, or use no/low heat. Cleaning Ceramic-Tile – Ceramic-tile floors can be cleaned easily with nothing but warm water, but be sure to sweep or vacuum first to remove any loose soil or grit (the Hurricane spin broom is the perfect choice for lifting dirt and debris, even between the grout lines.) A sponge mop is not recommended for ceramic-tile floors. It could pull dirt right into the grout tracks, making the floor more difficult to clean. A microfiber mop is a better alternative. A mild detergent can also be used (use as directed on the bottle), or try mixing 1/4 cup vinegar for every 4 cups water with a couple drops of dish soap and warm water. Cleaning Cork Floors – These floors are beautiful but their porosity makes them easy to damage, especially by excess water. For this reason, most cork floors are sealed, but you still need to proceed with caution. Frequent sweeping is recommended to prevent scratching – the Hurricane Spin Broom is a great option – and spritz your floor with water and a vinegar/dish soap solution. Clean with a microfiber head like on Hurricane Spin Mop. Cleaning Hardwood Floors – Sealed wood floors are usually coated to protect from stains and water damage. To clean, use a pH-neutral cleaner with water in a bucket. Stay away from acidic vinegar solutions and bleaches, which can dull wood floors over time. Clean using a well wrung out mop, preferably made of microfiber. For non-sealed floors, wet mopping is not recommended. Regularly sweep your floors to remove dust and dirt build-up, and once a year strip off old wax using mineral spirits or a hardwood wax stripper. Apply a fresh liquid or paste wax, then finish by buffing your floor. Best bet is to check with your flooring provider for details. Cleaning Linoleum Flooring – True linoleum is usually made from linseed oil, resin, limestone, wood fiber and cork dust, and colored with mineral pigments. Treat this resilient, natural flooring as you would cork. Cleaning a Vinyl Floor – A very popular surface found in both kitchens and bathrooms, vinyl floors are very easy to clean. A mild detergent can be used (use as directed on the bottle), or try mixing 1/4 cup vinegar for every 4 cups water with a couple drops of dish soap and warm water. The Hurricane Spin Scrubber with the flat head attachment will work well to clean your vinyl flooring. Cleaning Natural Stone Flooring – No vinegar for this type of flooring. Even a small amount could damage stone floors, as could bleach and ammonia. Instead, mop sealed stone floors with a pH-neutral, non-chelating cleaner that won’t react to the minerals in natural surfaces. 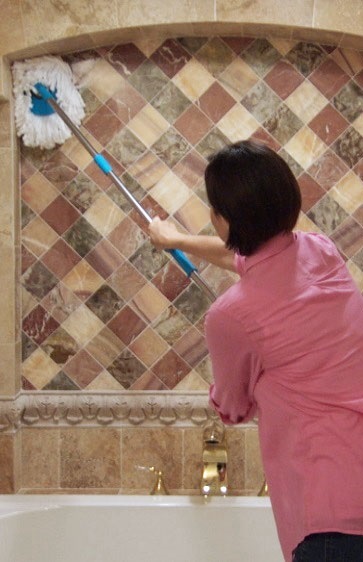 If your stone tiles are unsealed, mop with a microfiber mop and hot water; chemicals would penetrate the stone.